Book Review- Hazel Loutsis' Are We Really Going to Let Mum Backpack on Her Own — Always Packed for Adventure! PLOT- Hazel Loutsis was a single British woman approaching sixty, when she had a life-altering thought while at the dentist: rather than paying thousands of pounds for a procedure that she didn’t really need, she would spend the money on traveling the world. Loutsis put her affairs in order, bought a good backpack, and flew to India, to begin her year of adventure. LIKE- Loutsis has an amazing adventurous spirit, embracing all of the experiences that come her way. She picks destinations that are off-the-beaten path, rarely declines trying new things, and truly gets to know the people living in the places that she visits. 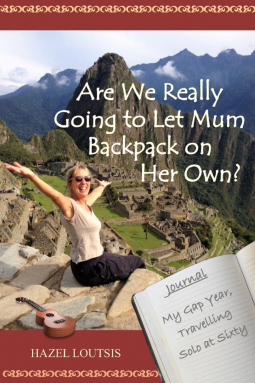 DISLIKE- Are We Really Going to Let Mum Backpack on Her Own, is a straight-up travel journal. It was just like reading a travel diary from a friend and lacked a sense of style that is found in professional travel writing.